Say goodbye to transaction fees and say hello to fall/winter fun! Be first in line. Activity registration is now available online with 0% transaction fee. What you pay at the front desk is what you pay online! Start your wish list now. Rec Pass Holders save 20% during Early Bird Online Registration, Monday, August 1 through Sunday, August 7 on most Fall/Winter 2016 Wylie Recreation activities! No Rec Pass? Save 5% during Early Bird Online Registration on most Fall/Winter 2016 activities. 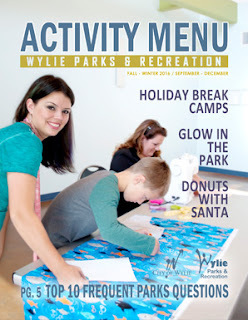 Standard in-person and online registration starts Monday, August 8, 9 am at Wylie Recreation Center. Standard Registration continues until activities are filled. A discount of 15% is applied to Rec Pass Holder activity registrations during Standard Registration on most Fall/Winter 2016 activities. Use your online account tied to your Rec Pass to receive the full discount. Some activity discount exclusions apply. Let us know if you have any questions!